Ange Postecoglou is the the Coach of the Australian national association football team. He is the most successful Australian club coach with two premierships, four championships and a continental title. He began his career at the South Melbourne Soccer Club playing in the National Soccer League in 1984, where he remained for his career, captaining the side from 1988 through to 1992. His representative career includes the Under 20 Young Socceroos in 1984-85 and he was an Australian Youth Representative at the World Cup in Russia in 1985. Postecoglou was a Socceroo from 1986 through to 1989. He started his coaching career in 1993 as the Senior Coach for Western Suburbs in the Victorian League. After a stint at the South Melbourne Soccer club, he was the assistant coach of the Socceroos in the 4 years leading up to the 2004 Athens Olympics where he was a member of the coaching staff for the Australian team. In 2000 he became the Australian National Youth Coach for under 17’s and under 20’s. His successes in this position include the Oceania Champions for both age groups in 2001, 2003 and 2005, as well as making the FINA World Cup Finals for both age groups in the same years. His teams have also won tournaments in Asia and South America over the past seven years. 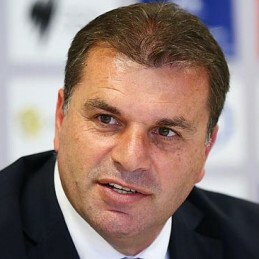 Postecoglou is also involved in a variety of football media, in radio, print and television. He has a weekly column with the Melbourne Herald Sun and appears as a analyst on Fox Sports. He also is a presenter on Radio SEN 1163AM in Melbourne. Postecoglou is an accomplished speaker who can delivery speeches which encompass team building, goal setting and motivation. He is also available for panel discussions and questions and answer sessions.